In January 2014, the Natural Resources Defense Council (NRDC) convened a group of experts from the National Marine Fisheries Service (NMFS), state fisheries agencies, academic institutions, and non-governmental organizations for a workshop on the science and management of data-limited fisheries. The goal of the workshop was to evaluate and seek to improve current methods for managing data-limited fisheries through an in-depth exchange of practical experiences combined with quantitative analyses and newly developed tools. An early version of of DLMtool was a focal point of the discussions. Since then, NMFS scientists have used DLMtool to evaluate management approaches for a number of data-limited fisheries. 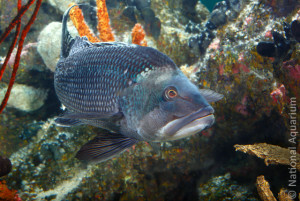 The National Marine Fisheries Service’s Southeast Fisheries Science Center has used DLMtool to review data-limited methods and their application to six tropical reef fish in the U.S. Caribbean (yellowtail snapper, hogfish, queen triggerfish, spiny lobster (two stocks, in St. Croix and St. Thomas/St. John), and stoplight parrotfish) and eight similar stocks in the Gulf of Mexico (red drum, lane snapper, wenchman, yellowmouth grouper, speckled hind, snowy grouper, almaco jack, and lesser amberjack). The Mid-Atlantic Fishery Management Council (MAFMC) has used the DLMtool to inform the management of three stocks: black sea bass, blueline tilefish, and Atlantic mackerel. In October, 2015, the MAFMC adopted a new acceptable biological catch limit for black sea bass based on a management strategy evaluation conducted by the MAFMC’s Scientific and Statistical Committee with DLMtool. Most recently, due to concerns about the increasing catch of blueline tilefish in areas north of where it has been managed historically, the MAFMC is considering adding blueline as a stock under management from North Carolina to the north. Once again, the Mid-Atlantic Scientific and Statistical Committee turned to DLMtool to recommend a new acceptable biological catch level for blueline. DLMtool was also used by the MAFMC to analyze harvest control rules for the Atlantic mackerel stock in order to shed light on why catch levels had declined so precipitously over time, from a high of more than 400,000 metric tons in the 1970s to virtually nothing in 2011 and to an average of about 13,000 metric tons since then.